"I had such a great time on Saturday. It was beautiful weather and I loved getting to work alongside the family and their friends." Allison U. Thank you to the Elders and Sisters for their hard work on our landscaping project. "Many hands make light(er) work!" These hardworking men joined us in April to help with some heavy landscaping. They were a huge help! We look forward to future partnering with the local Army Recruiting Center. Working alongside our partner family, our friends from SNOW helped paint our 50th home! They are looking forward to helping with landscaping in the Spring. Students and faculty from Wenatchee Valley College's CAMP program came out to serve in honor of Martin Luther King Jr. Day. CAMP chose to volunteer at Habitat For Humanity to help provide housing those who have none. After a heavy snow/ice fall, having a big team to clear the sub floor was extremely helpful. They also helped with framing on house #50 (Frances Ct.). They had a great time and we hope to have them back this spring. Students and faculty from The Bush School in Seattle arrived in Wenatchee for a week of volunteering on our current project on Frances Court. Sophomore, Junior and Senior students helped us prep two lots in our subdivision for sod installation. Our two newest homes will look wonderful with nice green lawns by the end﻿ of the week! Thank you students and faculty for coming to Wenatchee to lend us a hand! Members of S.N.O.W. 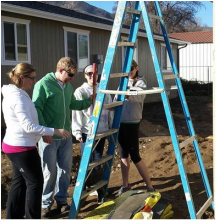 from Wenatchee Valley College spent the day volunteering at our current project in Wenatchee. 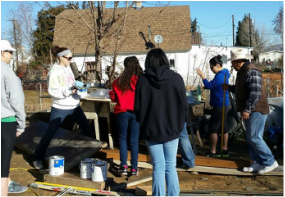 The foundation had just been poured and the students helped begin installation of the subfloor of our 48th home. Thank you Student Nurses of Wenatchee for your help! Cool and damp weather did not deter a crew of employees from Bank of America who came out to Make A Difference on our new home in Rock Island. A dozen employees came out and helped put up siding in hopes of finishing before the rain started. 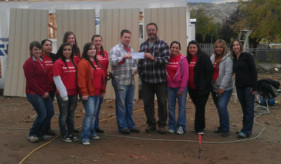 The group also presented a $2,500 check to Habitat for Humanity. Thank you Bank of America employees and Charitable Foundation!